Inception: The Imaginarium of Christopher Nolan? You’ve seen the gravity-defying trailer for Christopher Nolan’s mysterious, Leonardo DiCaprio–starring Dark Knight follow-up, Inception (due next summer), but so far no official plot details have been revealed. Until now, maybe! In Contention’s Kristopher Tapley claims to have spoken with someone who read the script, and he’s posted a bunch of spoiler-y plot details. Inception takes place in a world where we have developed a means by which we can enter people’s dreams. 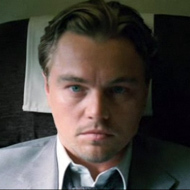 Leonardo DiCaprio’s character Jacob Hastley has been described as a “CEO type,” but he is also something of a criminal. He dives into people’s dreams to extract information. Tapley says it’ll take place in present day, and be a reality-grounded, “more tangible blend of Minority Report and The Matrix.” So, for the time being, there’s probably no need to worry about Inception resembling other upcoming dream-entering movies, we hope.